I am excited to announced Kaspar Szymanski, Google's search quality strategist will be joining us at SphinnCon Israel this January 9th in Jerusalem. 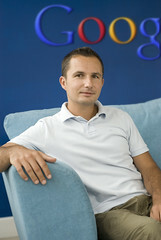 Kaspar joined Google in 2006 and works as a search quality strategist supporting search quality efforts across European languages. He is also the Google guide for the German and the Polish Webmaster help groups. Kaspar has a degree in information science from the Stuttgart Media University in Germany. You can follow Kaspar on Twitter at @kas_tweets. He actually tweeted about it saying "ירושלים בינואר SphinnCon -אני מגיע להציג ב." I will be interviewing Kaspar on stage at SphinnCon Israel, so if you want your chance to ask him a question, please submit your questions in the comments below. I will make sure to leave plenty of time for open question and answers. Kaspar also agreed to do site clinics if time and the network permits. Imagine, a Googler looking at your site and giving you one-on-one advice! If you are in the region in early January or just want an excuse to visit one of the most historic places in the world - make sure to sign up for SphinnCon Israel. Don't forget, submit your questions in the comments below.